April Fools' Day is now associated with Google and the countless pranks which show that Google hasn't lost its cheerfulness. 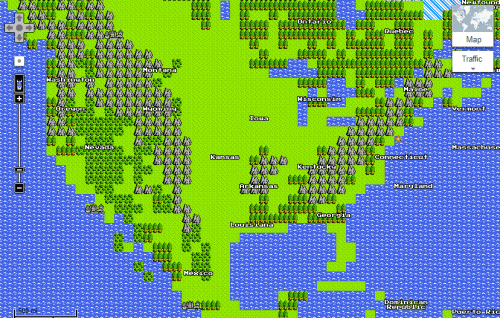 The first hoax for this year comes from Google Japan: you can now try the 8-bit version of Google Maps. Just click the "quest" button in the regular Google Maps interface. "Our engineering team in Japan understood the importance of maps on retro game systems. With the power of Google's immense data centers, and support from Nintendo and Square Enix, we were able to overcome the technical and design hurdles of developing 8-bit maps. Today, we're excited to announce the result: a version of Google Maps for NES, with beautiful low-res graphics, simple and intuitive controls, and a timeless soundtrack," explains Google. 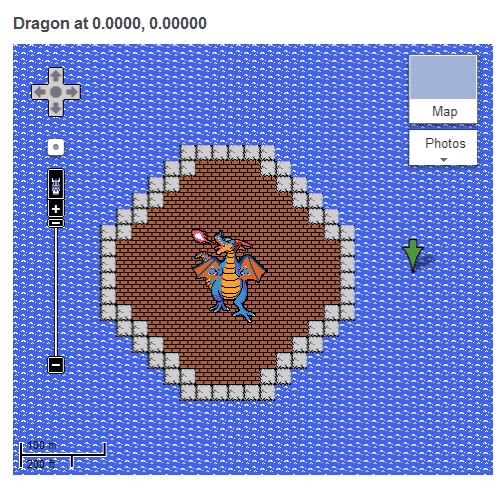 The 8-bit Google Maps hides some monsters from the Dragon Quest series. Google Japan also came up with a simplified IME for Japanese (Google Translate) that only uses a single key: space. 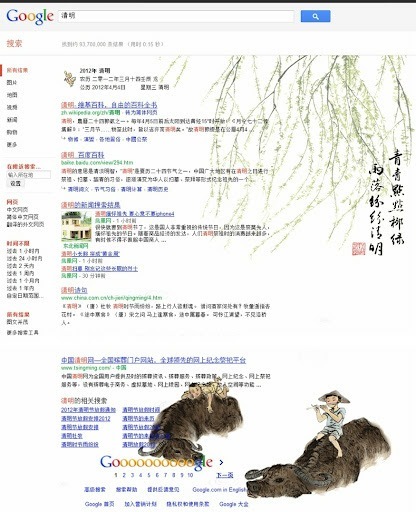 Google China changed the search results page for [Qingming], but you'll only see the beautiful animated wallpaper if you use Chrome. "The Qingming Festival (...) is a traditional Chinese festival on the 104th day after the winter solstice (or the 15th day from the Spring Equinox), usually occurring around April 5 of the Gregorian calendar" (from Wikipedia). Don't miss the underwater image search experience developed by Google China. It's so much fun to type your query. 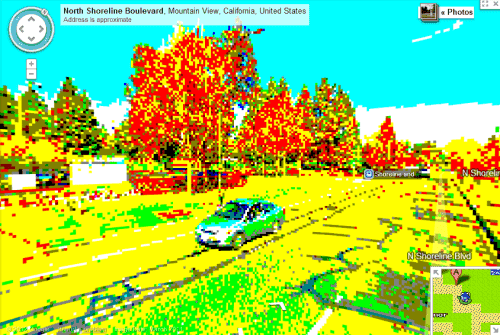 Google Australia found a way to capture more Street View images for Australia: Google Street Roo. 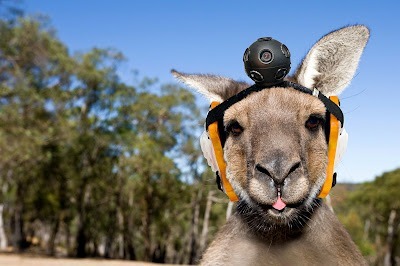 "Over the next four weeks, more than a thousand Big Red kangaroos will be equipped with a 360-degree head camera that will automatically capture images when the marsupial is on the move during daylight hours. The cameras on our Street Roo collection team will be powered by solar panels stitched into the back pocket of custom-made roo jackets. Images will be wired to Google in real-time. A GPS tracker embedded into the jacket will match the location of the kangaroo to ensure the image is accurately uploaded onto the new Street View layer." Inspired by the Japanese IME and the Morse Code, Gmail's team introduces a new way to type on a mobile device. "Gmail Tap takes the keyboard from 26 keys to just two. Every letter of the alphabet is represented by a simple pattern of dots and dashes, and once you know them you can type without even looking at your screen. This makes it ideal for situations where you need to discreetly send emails, such as when you're on a date or in a meeting with your boss." 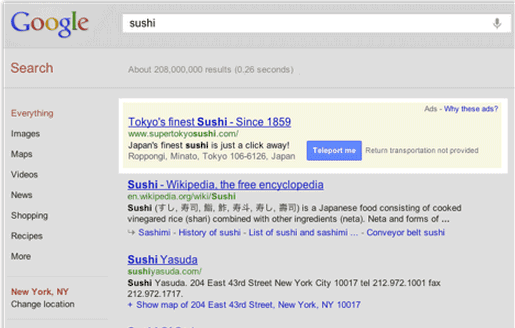 AdWords brings a new ad extension: click-to-teleport. "While features like call extensions and location extensions have aimed at solving the online to store marketing objective for multichannel advertisers, Click-to-Teleport shortens the offline conversion funnel by allowing a user to teleport directly to your business location by clicking on your search ad." 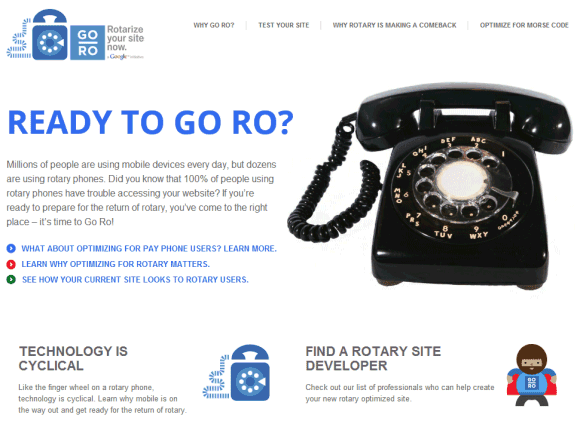 If you've already optimized your sites for mobile phones, you can now optimize them for rotary phones. YouTube offers a way to enjoy your favorite videos even when you don't have an internet connection. 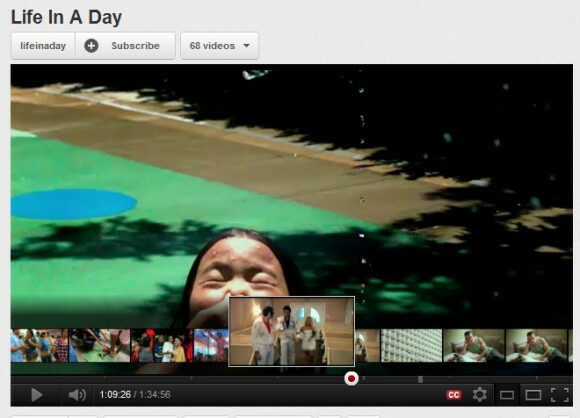 The YouTube Collection lets you watch any YouTube video on DVD and you can still share your feedback. 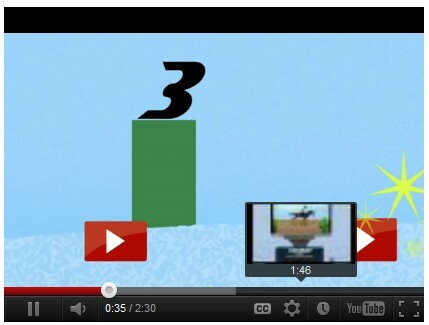 Just click the "home" button from the YouTube player to watch a demo. 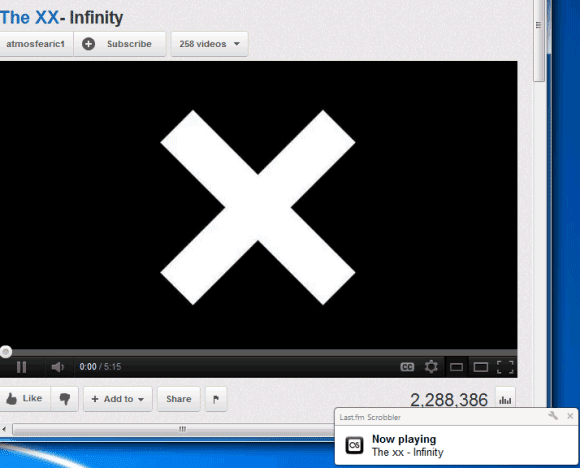 Chrome's engineers found a new way to multitask. "We call it Multitask Mode. Multitask Mode lets you have access to multiple mice at the same time, so you can make a chess move while you watch a dance move, or draw a horse while you draw on a friend for relationship advice. Chrome can handle as many mice, touchpads, styli, joysticks, trackballs, and other pointing devices as you can plug into your computer, so you and your friends can browse dozens of sites at the same time." Jargon-Bot for Google Apps translates business jargon into plain English. " Jargon-Bot has been integrated across the entire suite of Google Apps so that next time you are on an IM chat with your manager, it will help you recognize and say no to unrealistic expectations. When you receive an e-mail from your supplier, Jargon-Bot won’t let you get ripped off by demystifying the fine print," explains Google. Make sure you try the interesting new options from Google's search sidebar that let you find pages from the past: "Jurassic Era", "Victorian Era", "Enlightenment", "Once Upon a Time" and even tomorrow's pages. 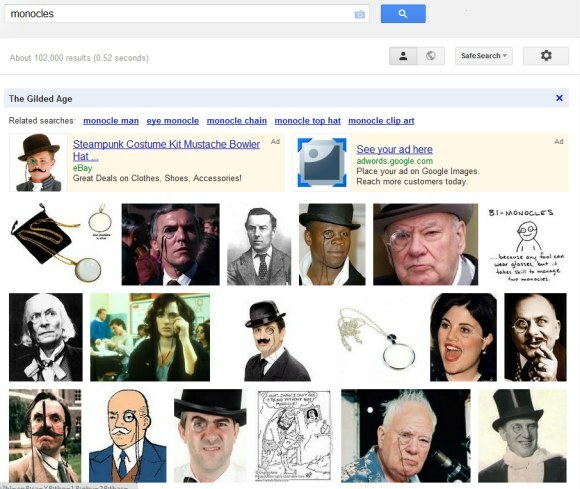 Image Search lets you find images from "the Gilded age". 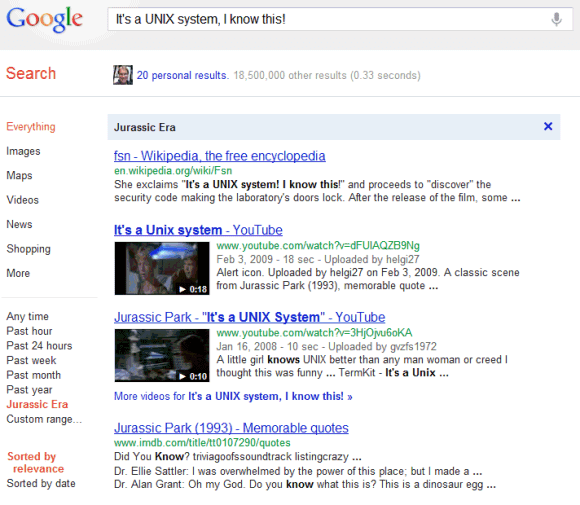 * Jurassic Era: It's a UNIX system, I know this! * Cretaceous Era: "dinosaur repellent" OR "time machine repair"
For even more search options, try Google Really Advanced Search. You can find pages with words "almost, but not quite entirely unlike" a word you enter, "this exact word or phrase, whose sum of unicode code points is a mersenne prime". You can narrow the results by font, textured background, "embarrassing grammatical faux pas" or "looping midi music". 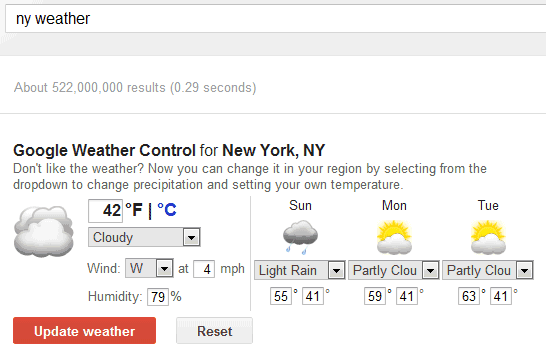 Google's weather OneBox is now more powerful and it lets you change the weather. "Don't like the weather? Now you can change it in your region by selecting from the dropdown to change precipitation and setting your own temperature. Please notice, after submitting it takes approximately 45 minutes until your weather changes take effect," informs Google. There's also a new Cloud API for the App Engine which lets you "gain cloud coverage in locations around the globe within minutes". 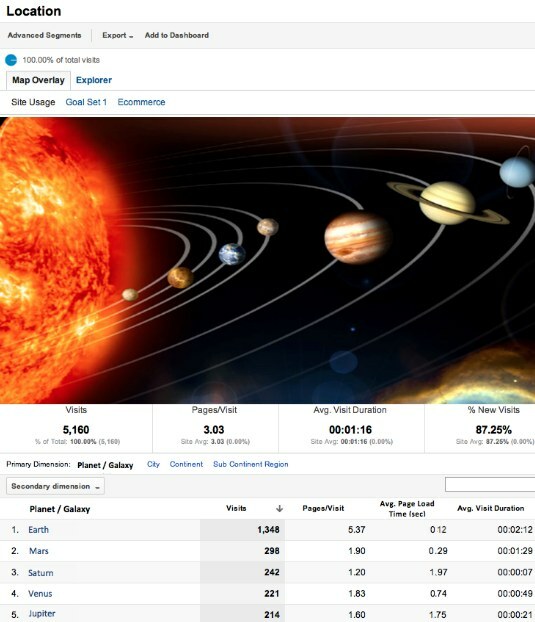 Google Analytics promise to add support for interplanetary reports, just in case your site has visitors from another planet. "While currently you only get a partial picture of website visitor location, we want to expand beyond Earth to help you understand visitor activities from neighboring stars and planets. You’ll also be able to drill down on each planet to see greater detail. For example, which colony or outpost your visitors came from similar to the city drill down available for Earth today." 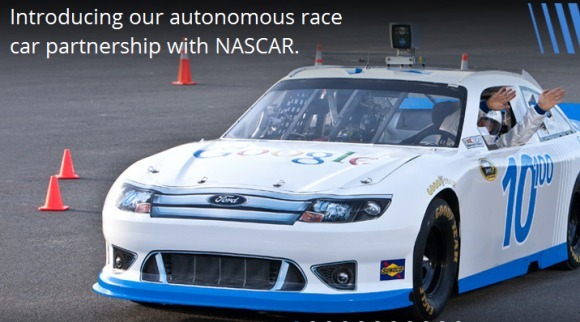 Self-driving cars are becoming a reality, but happens if you bring self-driving cars to NASCAR? "Our autonomous cars have now been test-driven (or rather, test-ridden) for more than 200,000 miles without a single machine-caused mishap. And today we're moving the project one great leap forward with Google Racing, a groundbreaking partnership with NASCAR to help self-driving vehicles compete in the world of stock car racing." Google is bringing an ultra high-speed fiber network to Kansas City, but also releasing a Fiber Bar. "Google Fiber starts with 100 times more fiber than any source of fiber available today. Tested in labs across our Mountain View campus, we found that in just the right synthesis, psyllium and vitamins C and D morph into a byproduct we have coded as Fiberlicious. This smarter fiber delivers just what the body needs to sustain activity, energy and productivity up to 100 times more than you have experienced before." 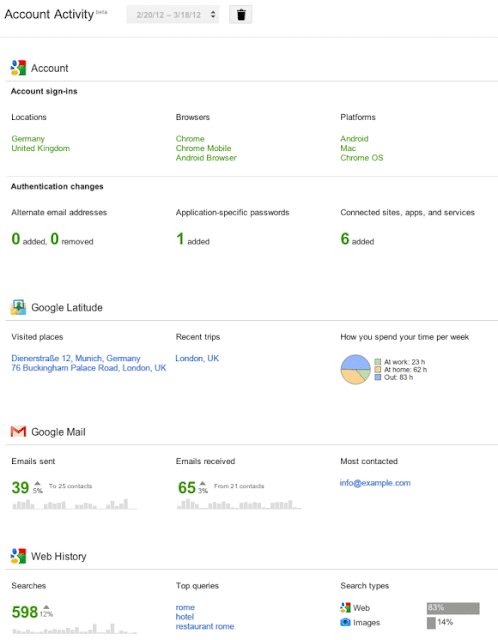 Google added an interesting feature that shows stats for services like Google Latitude, Gmail, Google Search and more. If you go to the Account Activity page, you can opt in for a monthly report that provides a "summary of your account activity across many Google products". It's like a personal Google Analytics, but it's less detailed and it focuses on security features. For example, Google shows a list of locations and browsers detected when you've signed in. If you never use Opera, but the browser is included in Google's list, then it's likely that someone else found your password. The activity page also includes the number of emails you've sent and received, the number of Google searches and stats from Google Latitude, Picasa Web and YouTube. I've enabled this feature and Google says that my "next report will be ready in a few days" and I'll receive an email notification when it's ready. It would be nice to aggregate the data in real time and integrate Account Activity with Google Dashboard, which already shows some stats. 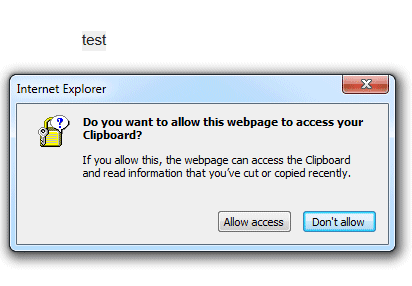 A major annoyance when you use web apps that include a rich text editor is that they don't have access to the clipboard. Browsers prevent web pages from reading the clipboard or replacing its text and that's a security feature, but the downside is that apps like Google Docs can't include functional options for copy, cut or paste in the interface. Of course, you can use the browser's features, including keyboard shortcuts like Ctrl+C and Ctrl+V, but not everyone will do that. 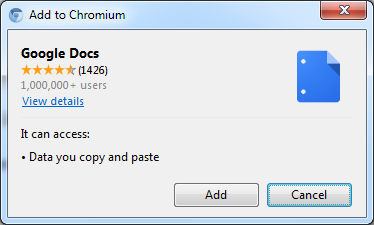 Let's see how Google Docs handles this issue. If you use Internet Explorer, cut/copy/paste are available in the Edit menu and in the contextual menu. When you use these features, a browser dialog asks for permission. Annoyingly, IE will ask for permission again when you open a new document or reload the page. In Firefox, cut/copy/paste are removed from the contextual menu, but they're still available in the Edit menu. Try to click one of these options and Google Docs will ask you to use keyboard shortcuts. Google Toolbar for Firefox included an option that addressed this issue, but Google Toolbar is no longer available for Firefox 4+. Fortunately, there are some workarounds. What happens when you use Chrome? 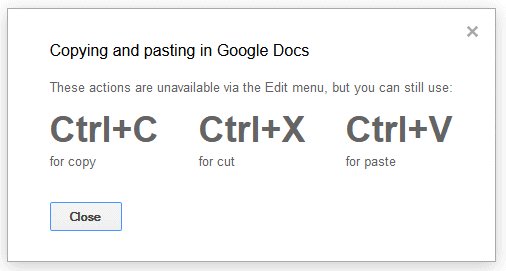 Select some text, right-click, choose "copy" and Google Docs shows the following message: "Copying and pasting requires the free Google Docs web app. This lets us access your clipboard so you can cut, copy and paste." To install the app you don't need to open a new page, but you'll have to reload Google Docs to use the new permissions. For now, the best thing you can do is to use keyboard shortcuts (Ctrl+C for copy, Ctrl+X for cut, Ctrl+V for paste) or install the Google Docs app in Chrome. Google's search engine has a great spell checker because it doesn't rely on dictionaries and because it's context-sensitive. The smart spell checker from Google Search is now available in Google Docs. When you type "its", no English spell checker will ever find a mistake, but a smart spell checker will flag it when you add more words: "its a great idea". While "its" is actually an English word, it should be replaced with "it's" in that particular context. The updated spell checking feature from Google Docs is more precise and it will usually show a single suggestion when you right-click a word that's highlighted. Another advantage is that it works well when you type proper nouns. "Suggestions are constantly evolving. As Google crawls the web, we see new words, and if those new words become popular enough they'll automatically be included in our spell checker—even pop culture terms, like Skrillex," explains Google. That's the great thing about web services: they evolve faster and they can become smarter by bringing more data. Just like Gmail's spam filter is better than the spam filter of a desktop mail client and Google's online speech-to-text engine is better than any offline speech recognition software, the smart spell checker from Google Search and Google Docs (originally available in Google Wave) is better than any dictionary-based spell checker. There are some downsides (it doesn't work offline and everything you type is sent to Google's servers), but all Google services and software could be improved by switching to the online spell checker. Unfortunately, the example I used back in 2009, when Google Wave added a context-sensitive spell checker, no longer works today. When you type: "Their coming too sea if its reel" in Google Docs, only "too" and "sea" are flagged, while no misspelled word is flagged in Google Search. Blogger blogs are no longer that limited. After adding support for static pages and favicons, Blogger added some new advanced features to the "search preferences" section of the settings page. 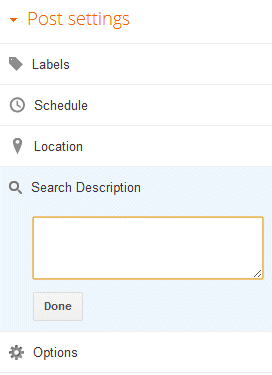 Now you can edit the description meta tag without editing the template. If you edit the description meta tag for the entire blog, you can also write descriptions for your blog posts. This is useful because Google's snippets sometimes rely on this meta tag. For the first time you can create a custom 404 error page for a Blogger blog without buying a domain. Just "enter an HTML message that will be displayed on the Page Not Found page instead of the generic message." 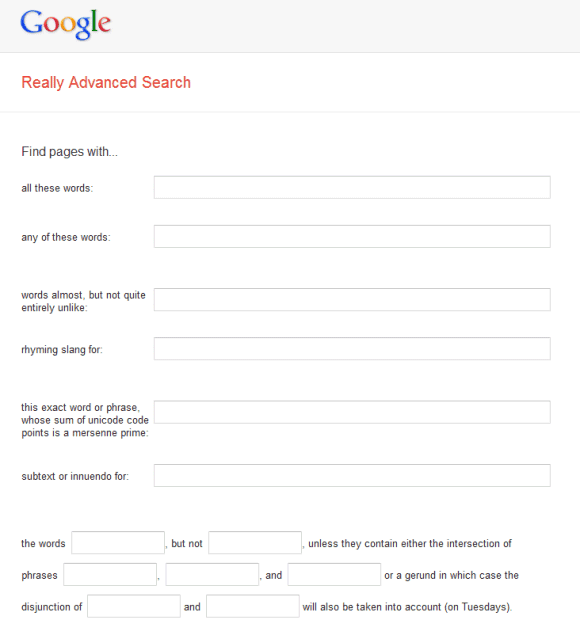 Google has some tips for creating useful 404 pages and there's even a widget powered by Google search that shows related links and a search box with appropriate search suggestions. You can also create custom redirects, but only for internal URLs. 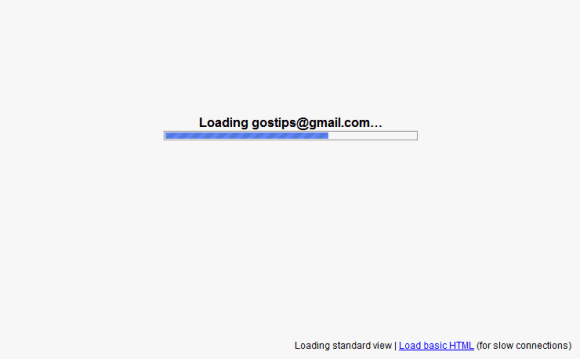 For example, you can redirect http://googlesystem.blogspot.com/mailto to http://googlesystem.blogspot.com/2012/02/open-mailto-links-using-gmail-in-google.html. Make sure that you leave out the first part of the URL (http://googlesystem.blogspot.com) when you create the redirect. 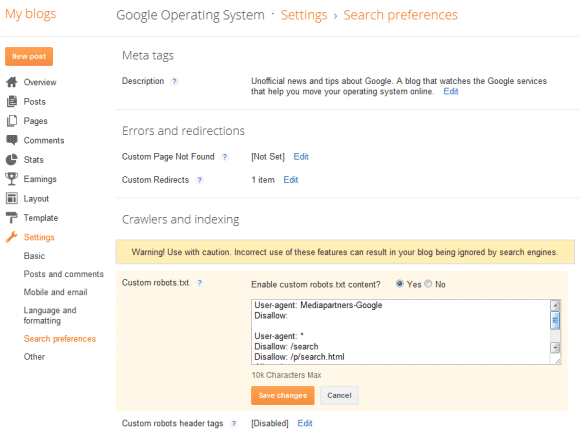 There are also options for customizing the robots.txt page and robots header tags. It's probably a good idea to use Blogger's robots.txt page as a template (http://yourblog.blogspot.com/robots.txt) and only add some new pages you want to be ignored by search engines. If you don't like that the new Gmail interface replaced most text labels from buttons with icons, there's an option that lets you disable this tweak. Just go to Gmail's settings page, select "text" in the "button labels" section and click "save changes". "Icons brought consistency across languages and solved problems with functions that had long names. Some people loved the new icons. Others, especially low vision users, found words easier to distinguish," says Google. My main issue is that some of the Gmail icons aren't very helpful. For example, it's not obvious that the exclamation mark is an icon for reporting messages as spam. The icons are also small and monochromatic. 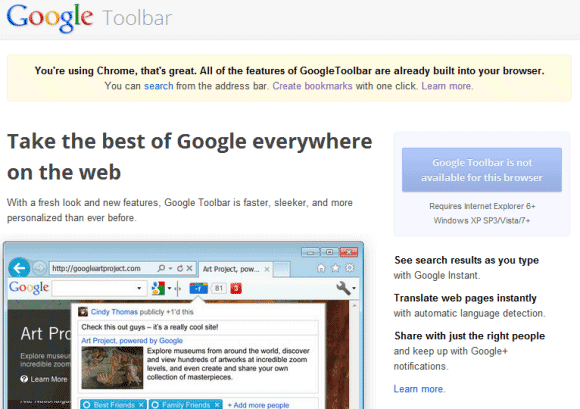 Now that Google Toolbar is no longer available for Firefox, you can only install it if you use Internet Explorer. 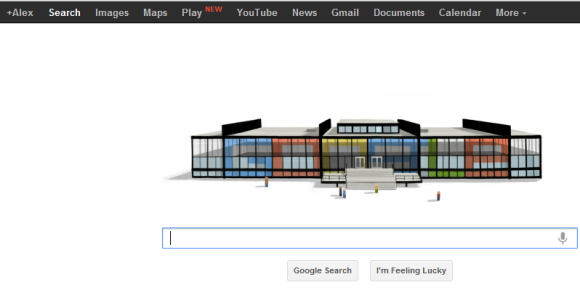 If you visit Google Toolbar's site using Chrome, Google shows an interesting message: "You're using Chrome, that's great. All of the features of GoogleToolbar are already built into your browser. You can search from the address bar. Create bookmarks with one click." If you use Firefox, Google Toolbar's homepage suggests you to download Chrome if you want "to get all of the features of Toolbar and more". 7. the "share" button that supports services like Facebook, Twitter, Yahoo Mail, etc. While Google Toolbar will not be available for Chrome and some Google Toolbar features are either included in the browser or can be added from the Chrome Web Store, it's misleading to say that "All of the features of GoogleToolbar are already built into [Chrome]". After a strong start, Google+ could have lost its momentum, at least if we are to believe ComScore's numbers. "According to comScore, Google+ users averaged only three minutes on the site during January, a pittance compared to Facebook's average of 405 minutes per visitor." That's a really low number, but I'm not sure it's accurate. Google+ is not a separate service like Google Finance or Google Scholar, it's the social fabric from many Google products. Below Google's navigation bar, there's always a share box and a notification button that lets you read comments and post your replies without visiting Google+. Google's search results include pages shared by your Google+ circles, YouTube's homepages shows videos shared by the people you follow in Google+ and many pages have +1 buttons. 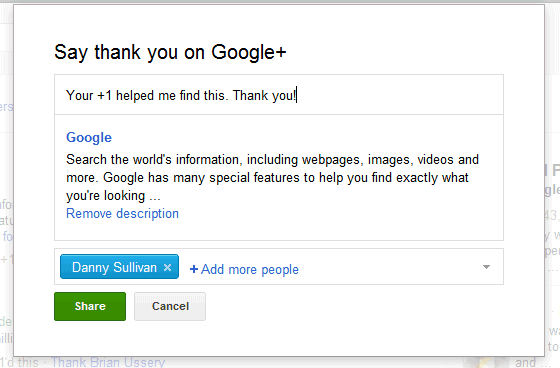 You're using Google+ even you're not visiting plus.google.com and that's because Google+ is an upgrade, not a new product. "This is just the next version of Google. Everything is being upgraded. We already have users. We're now upgrading them to what we consider Google 2.0," says Vic Gundotra, Google VP. Google's bet is so significant that Google+ simply can't fail. Google+ is just a fancy name for a new Google that knows more about you, so that it can offer a more personalized experience. Upgrading to Google+ will offer better search results, better ads, simple ways to share content, collaborate and communicate with the people you care about. It's the same Google made more powerful by a social upgrade. It looks like Google Play, the unified online store launched yesterday, could add a new type of digital content: audio books. 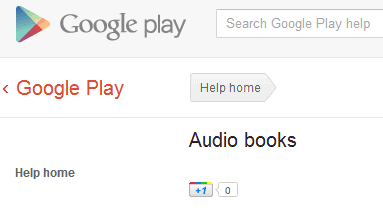 The Google Play help center includes an empty page titled "Audio Books". 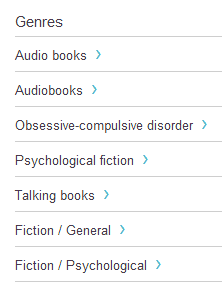 There are also two genres with a similar name: "audio books" and "audiobooks", but the ebook store doesn't include audio books. Genres could be automatically generated. Google has recently registered a lot of domains like googleplaymovies.com, googleplaynewspapers.com, googleplaymagazines.com, googleplaytv.com and this suggests that Google Play could offer subscriptions for magazines, newspapers and TV shows. YouTube started to roll out a few features that will make it easier to preview videos and to quickly jump to a certain scene. Just mouse over the seek bar and you'll see a thumbnail of the frame you've selected. The thumbnail is updated almost instantly when you pick a different frame. This feature is obvious and you'll certainly notice it. There's also a way to preview multiple frames: just drag the handle along the seek bar and YouTube will "show a filmstrip of thumbnails of previous and upcoming scenes". For movies and other videos longer than 90 minutes YouTube added a more advanced feature: a second seek bar that lets you preview one and a half minutes of video one second at a time.